Losing your wallet can cause your brow to sweat and your blood pressure to rise. Ditto for getting a call from your bank saying your credit card has been compromised. No one wants to deal with card fraud, but unfortunately, many of us do.More than 2 out of 5 Americans with credit cards experienced some kind of credit card or debit card fraud in the past five years. About a third of card fraud in 2008 involved counterfeit cards or lost or stolen cards. That amounted to $2.44 billion in card losses that year. No card is invulnerable to fraud. But every type of payment card, from the traditional card with the magnetic stripe to the emerging virtual cards on smart-phones, comes built with security features to make it harder for someone to steal your card info at checkout. When using one of your cards, know what its strengths and weaknesses are to protect yourself against losses. We are continuing to have issues with water at the club house. Due to the possibility of cold weather, we will hold our February meeting at Shoney’s, 2645 McGavock Pike right off Briley Parkway (map). The meeting still starts at 7:00 PM. We hope to see everyone there. Come early, enjoy a meal and socialize. The Nashville Amateur Radio Club (NARC) will again be involved with the Adventure Science Center (map) for its annual Engineering Day event. NARC and local high school students will showcase and test their entries in the 7th Annual Music City Bridge Building Competition, presented by the American Society of Civil Engineers (ASCE), Nashville Chapter. This year, Engineering Day is on February 22 from 10:00 AM to 3:00 PM. More information can be found on the Adventure Science Center page for the event. Saturday, Feb. 22 | 10 a.m. to 3 p.m.
Local engineers will be on hand at Adventure Science Center for its annual Engineering Day. During the event, visitors will have opportunities to learn about a variety of engineering specialties and participate in hands-on activities to help them gain a better understanding of the concepts used in the field. Back again this year, Nashville Amateur Radio Club and local high school students will showcase and test their entries in the 7th Annual Music City Bridge Building Competition, presented by the American Society of Civil Engineers (ASCE), Nashville Chapter. All Engineering Day activities are included with general admission, except where noted. Subject to change. Industry Canada has granted Amateur Radio operators there the use of five 60 meter channels on a non-interference basis. The center-channel frequencies harmonize with those available to US radio amateurs on 60 meters: 5332 kHz, 5348 kHz, 5358.5 kHz, 5373 kHz, and 5405 kHz. 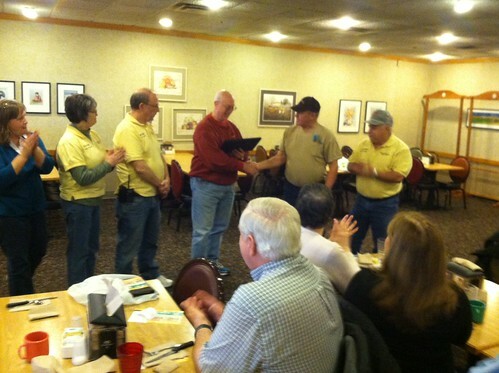 Ed Nutter KE4JWS presented Keith Miller N9DGK with an honorary NARC membership during the February 1st club breakfast.